What is popstar academy week? Popstar Academy is a weeklong club that takes place during school holidays designed to get kids ages 7-11 ready for the life of a popstar! What activities do we do at popstar academy week? 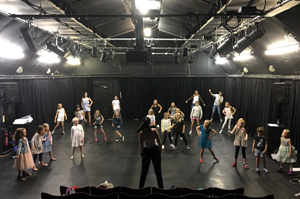 Popstar Academy Week is full of fun activities to keep the kids entertained, this includes; Learning songs, Singing Songs, Dancing, Recording, modelling with a photoshoot and a end of week performance at the forest arts centre for friends and family! The dates for our next popstar academy are April 15th-19th. Four of the days are 9am till 3pm at Barton Court Studios, then the last is at The Forest Arts Centre. It’s £130 for the week, included in the price is a CD, photos from photoshoot and a certificate to show you’ve completed the popstar academy! To book, please call 07957 425 194 or email Bartoncourtstudios@outlook.com – Spaces are limited and we tend to book up in advance so be safe, not sorry and book your child in as soon as possible! Previous Musical Madness – SMASH HIT!